NEW YORK (AP) Joel Embiid has endured too much misery in the NBA to miss one of the fun days on the schedule. So as soon as he knew his back felt up to it, he couldn’t wait to get on the court for his first Christmas Day game. Embiid had 25 points and 16 rebounds, JJ Redick scored 24 points, and the Philadelphia 76ers snapped a five-game losing streak with a 105-98 victory over the New York Knicks on Monday. Neither Embiid nor Redick was cleared to play until going through pregame warmups, and their presence gave the 76ers just enough to win their first Christmas Day appearance since 2001. Embiid, who has been battling a bad back, powered through a big-man duel with Enes Kanter, who had a season-high 31 points and tied a career best with 22 rebounds. He joined Wilt Chamberlain, Bill Russell and Bob Lanier as the only players with a 30-20 game on Christmas, according to research provided to the Knicks by Elias. Redick, who missed the last game with right hamstring tightness, helped the 76ers pull away from an 89-all tie midway through the fourth quarter. He’s played in Christmas games before – and made clear again he’s not a fan of them – and he thought his young teammates responded well to their first opportunity. ”There’s a tendency to try to put on a show instead of just going out and competing, and I think we did a great job of just going out and competing,” Redick said. Kristaps Porzingis scored 22 points for the Knicks, who fell to 22-30 on Christmas with their fifth straight loss on the holiday. Backup point guard T.J. McConnell had Philadelphia’s final eight points of the third quarter, and the 76ers pushed the lead to nine with about 9 minutes left in the game. The Knicks battled back to tied it 89 on Porzingis’ three-point play with 5:20 left, but Philadelphia promptly scored the next seven to go up 96-89 on Redick’s 3-pointer with 3:34 to play. Philadelphia’s young stars kept the Knicks from getting much closer, with Embiid making a 3-pointer and Ben Simmons stealing Porzingis’ pass and dunking it, both times hiking the lead back to eight. 76ers: Coach Brett Brown called Embiid a ”borrowed stud” who they get to ”inherit” when he is able to play. ”He doesn’t practice and he comes in and plays games and we’re trying to grow him into a situation where he is a normal part of a team,” Brown said. … The Sixers franchise is 17-13 on Christmas. Knicks: Hall of Famer Bernard King, who set the Christmas record when he scored 60 points for the Knicks against the Nets in 1984, was at the game. 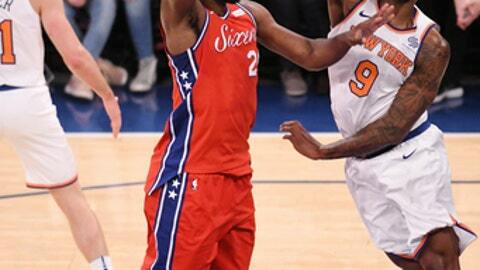 … New York had won seven straight at home over Philadelphia. Porzingis could’ve been playing for the 76ers instead of against them Monday. The Knicks took him with the No. 4 pick in 2015, one spot after Philadelphia went with Jahlil Okafor, who eventually fell out of the rotation entirely and was dealt earlier this month to Brooklyn. But Brown declined to look back, saying ”next question” when asked if he ever wondered ”what if?” when it came to Porzingis. 76ers: Visit Portland on Thursday. Knicks: Visit Chicago on Wednesday.